There are two things I look for when making a side dish for dinner. The first is for the side to be super easy and something I really don't have to pay attention to. That way I concentrate on the main dish, my kids, teaching my mom to use Facebook, the usual. The second is for the side to be something I don't have to convince my kids to eat. For some reason carrots always seem to be a hit with them. These oven roasted carrots are just so simple, sweet, and tasty. They are the first thing to disappear at dinner whenever I make them. My daughter likes them cut up in bite sized pieces, but my son like to pick them up and eat them whole. 2. 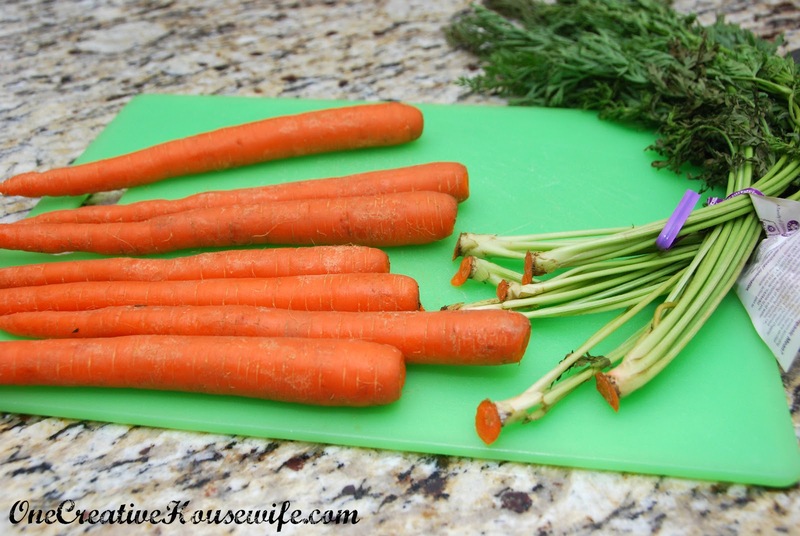 Cut the tops off of your carrots. 3. Wash your carrots with a vegetable brush and pat dry. There is no need to peel the carrots. 4. 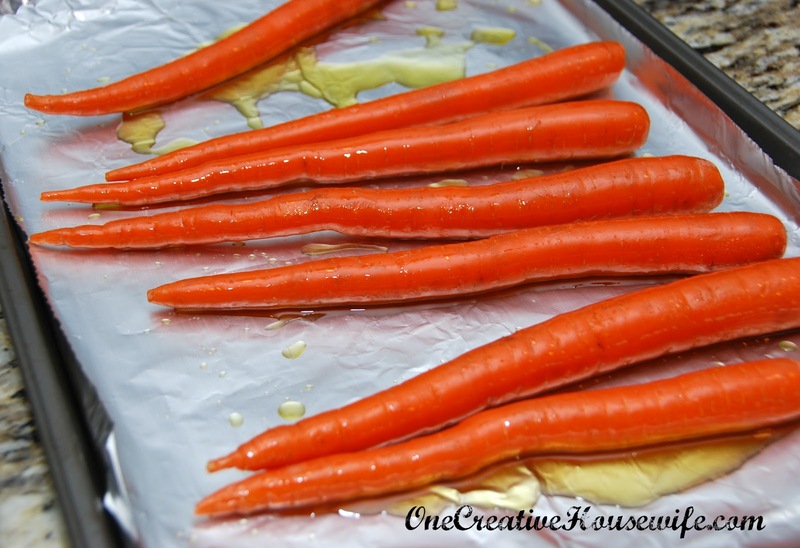 Place carrots on a foil lined baking sheet. 5. Drizzle the olive oil over the carrots. 6. Lightly sprinkle the carrots with sea salt. 7. Place in your oven on the middle rack. 8. Bake for approximately 30 minutes (the time may differ due to the diameter of your carrots). 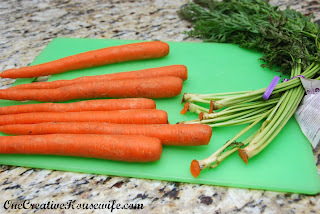 The carrots should be soft and easily poked through with a fork at the thickest part. These are seriously the most tender, sweet, delicious carrots I have ever had. And the sea salt adds a little bit of contrast to the sweetness and a little crunch. Yum!!! ~I have found the smaller the diameter of the carrot the sweeter it seems to be. ~You could use coarse sea salt, but I find that to be a little much. Thanks for this great recipe. 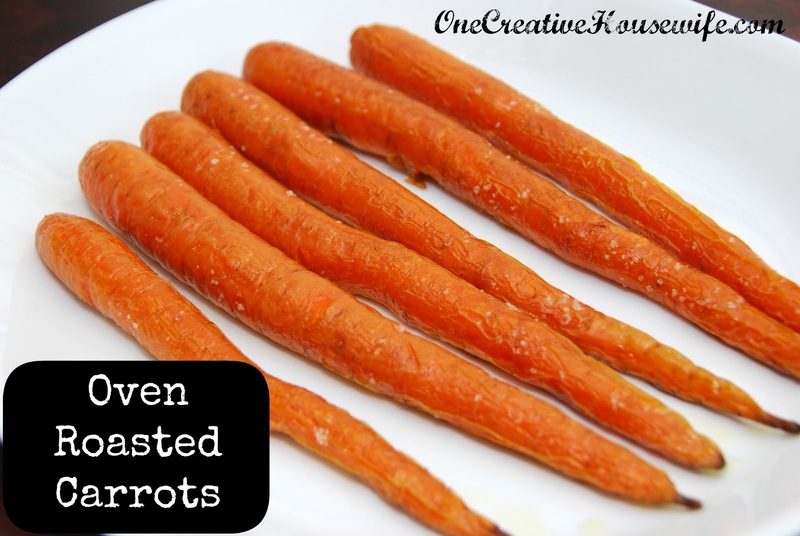 I have never roasted carrots and right now I have plenty.I love the not having to peel part :) Thanks for linking up at The Gathering Spot! Thanks for stopping by. I hope you enjoy the carrots!! Another one to surprise the dinner crew... Wonderful!